San Francisco has been under the rain today, and it might be a sign that fall is very much around, warning you that more rainy days are on their way. Even though, it’s not Thanksgiving yet, I am already thinking about the Thanksgiving dinner menu…I think this year, there will be many appetizers like this one. I am simply in love with simple and flavorful bites that “mettent en appétit” (open your appetite) and can be enjoyed with a fresh glass of Champagne. I noticed many of my friends don’t like cauliflower, I am not sure if its the texture or the taste, so sometimes I just play with cauliflower and try to serve it in various forms and textures. Of course, you can substitute cauliflower with other ingredients, such as avocado, carrots, etc…I served this a few times with an avocado purée and it was simply delightful. If you don’t want to serve this in a spoon, you can serve it in a small plate, add one extra tbs of cauliflower mash, and add four shrimps. That would be sufficient as an appetizer and you really don’t have to spend hours cooking. This is a fairly simple dish to prepare and no one needs to know that it takes only a few minutes for the whole dish to be ready. The only little trick about using small spoons, is that you need to pay attention to small details, and make sure your presentation is clean and tidy. All the ingredients being cut in tiny pieces, they need to be well put together in a regular order. Bring a large pot of salted water to a boil. Add cauliflower and cook until soft. Drain, place in a mixing container and mash with a potato masher, leaving small pieces. Add habanero sauce, olive oil , salt and pepper. Mix well all ingredients and keep warm. In a container, combine shrimps, curry and paprika powder, lemon juice, salt and pepper. Heat olive oil in a pan and saute shrimps. Place 1 tbs of cauliflower in each spoon. 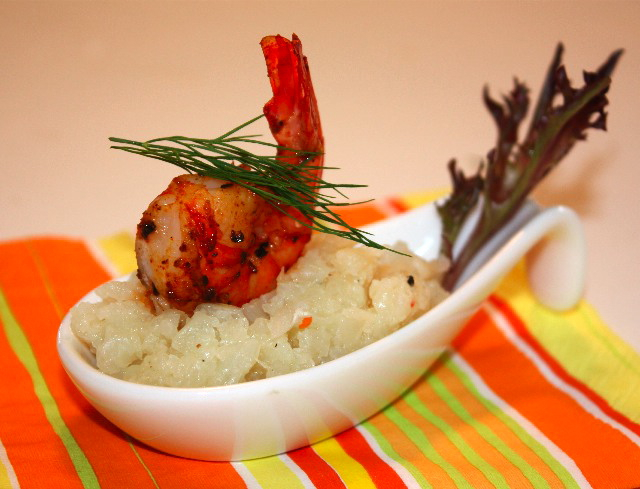 Top it with one shrimp and a little sprig of dill. 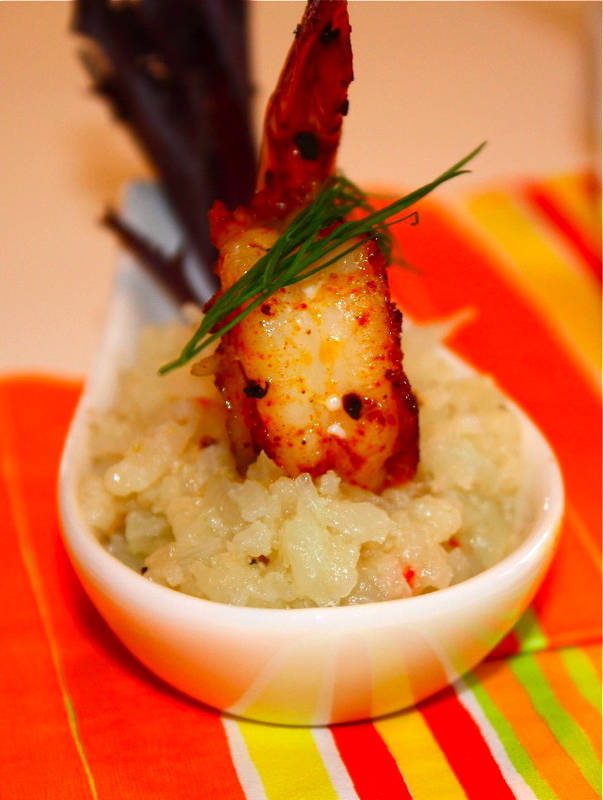 This entry was posted by silvia on November 7, 2010 at 9:25 pm, and is filed under Appetizers, Express - Less than 30 minutes, Fish/Seafood. Follow any responses to this post through RSS 2.0.You can leave a response or trackback from your own site. Hmm..mm… simply wonderful! I can eat a few of these. And the recipe sounds very easy to handle as well. Thanks again, Silvia. Hope you’re having a great week ahead. What a great combination of flavors! I’m really intrigued by this, and love the presentation in Chinese soup spoons. Just beautiful! These would be such an elegant start to what I’m sure will be a glorious meal! I adore cauliflower, and I’m always looking for new ways to use it. Thanks for sharing, sweet friend! I hope your week is full of joy. This looks beautiful! You have it presented so nicely! This sounds so wonderful, I want to make it tonight as a main dish and eat all the shrimps myself! A really unusual recipe, Silvia! 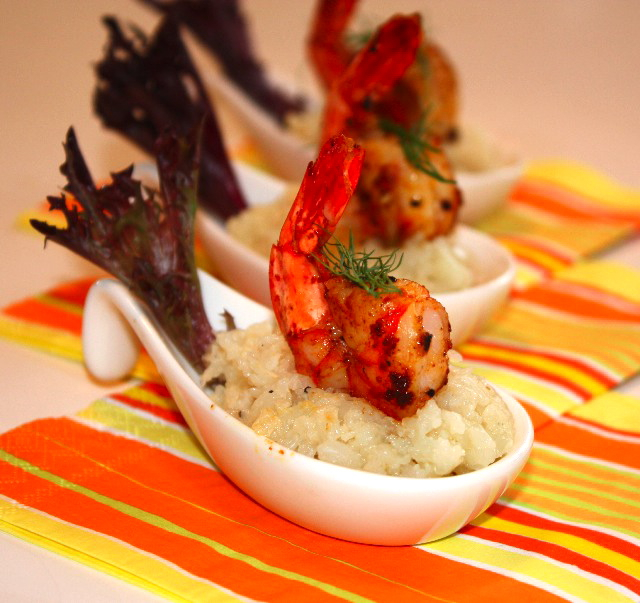 Never would have thought to combine cauliflower with the shrimp. What a flavorful mouthful to start off your dinner!